Michelle Wright, Chief Executive of Cause4, trained at the Guildhall School of Music & Drama and played the violin professionally. A chartered marketer, manager and fundraiser, Michelle set up B-Corporation and social enterprise Cause4 in May 2009 and since has undertaken major strategic and business development projects, including campaign developments with a number of national charities and consultancy work for FTSE 100 brands developing their cultural sponsorship programmes. Michelle also specialises in philanthropy, having recently developed a number of major philanthropy projects for charities and corporates, and having set up new philanthropic foundations for sports stars, artists and entrepreneurs. In 2014 Michelle was awarded the IWEC award for outstanding entrepreneurial achievement, and represented the UK as a National Champion for Entrepreneur of the Year in the European Business Awards. In 2015 she was recommended to the Maserati 100 list for Entrepreneurs that ‘give back’ and was voted by Salt Magazine as one of the top five compassionate business leaders in the UK, alongside leaders such as Richard Branson. She won the Gold Award for Women of the Year at the San Francisco International Women in Business Awards in 2016 and was awarded the Freedom of the City of London by the Guild of Entrepreneurs in 2016. E(lectronic) waste is the world’s fastest growing waste stream. Roslyn founded MobiCycle Ltd to empower consumers and organisations to reuse, repair and recycle electronics while completing her MSc in Major Programme Management. Her postmodern dissertation explores how billion pound major programme managers can prioritise locally derived social and environmental benefits over time and cost overruns. Her dissertation also recommends authentic partnerships with local communities operating at the grassroots level. As a for-profit social enterprise based in London, MobiCycle employs a few tools to launch the business. In this talk, Roslyn will explain how MobiCycle regularly solicits input from actors across the public, for profit and third sectors to paint a bigger picture. For example, journey mapping elucidates the shadowy areas within the circular economy. In these places, we see flytipping, the incineration of plastics, the landfilling of precious minerals and illegal overseas shipments. Mapping the problem is the beginning. The challenges around creating a sustainable business model plague many if not most social entrepreneurs. Over five years, Roslyn learned how to build a product portfolio that melds cutting edge technology with behaviour change. She constantly asks: how can an entrepreneur maximise income generation while staying true to the core mission? She will share how and when to approach investors or apply for government funding. Finally, Roslyn will discuss some tips on how to leverage technology for non-technical founders. Dr Alibeth Somers, Director of Evaluation and Impact, Nightingale Hammerson & Co-Founder and Director of Apples and Honey Nightingale CIC. Ali began her career in social enterprise as Director of Policy and Development for Social Enterprise London. She then went on to develop an expertise in social impact measurement. Ali was the first Course Director for the MA in Social Entrepreneurship here at ICCE. When taking an extended maternity leave, Ali was approached by her friend Judith Ish-Horowicz, MBE to set up a nursery in a care home. The nursery, Apples and Honey Nightingale CIC, opened in September, and is the UK’s first nursery co-located within an elderly care home with daily intergenerational activities. Ali is coming to speak to us about the trials, tribulations, tears, and happiness that derived from her three year adventure in setting up this new social enterprise. Robert Ashton failed his 11+ exam in 1966 and only decades later realised his problem was that he was rather bright, not stupid as he’d been told at school. He’s now a member of Mensa, the High IQ Society. He left a corporate sales and marketing career in 1990 to find his own way in the world. Since then he’s started and sold businesses, written 19 books and sparked the formation of what is now the UK’s top performing Community Foundation. He’s helped countless social enterprises get off the ground, often asking difficult questions of politicians to win the support needed to enable positive social change. He’s led a successful asset transfer, created an urban community land trust. In 2013, founded Swarm Apprenticeships, a social enterprise that uses enterprise qualifications to empower bright young people who fall through the education net as he did 50 years ago. Robert will tell his story and explain why he thinks now is the perfect time to start a social enterprise. Andrew Curtis is a co-founder and Director of The Dragonfly Collective (Melbourne and UK). Andrew has supported some of the most vulnerable and disadvantaged communities in Australia and the UK through executive leadership, Board membership, academic research and lecturing, project design and hands-on service delivery. An original member of the Social Entrepreneurs Network in Australia Andrew has consulted to both government and a range of social enterprises – from the very large to the very small. Andrew has a PhD in hermeneutics and an MBA – combining critical thinking with business models and practice. Intrigued by the campaigns around social enterprise in the UK and the lack of a clear definition, this seminar will focus on the politics of social enterprise and how social enterprise can be co-opted by numerous causes. Rhys Pritchard is the manager of Restoration Station, established by Spitalfields Crypt Trust (SCT). For over 50 years SCT has been supporting people recovering from addiction and homelessness by helping them to get clean and sober, develop self-respect and hope for a much better future. They also run a number of social enterprises that provide a supportive training ground for those in the later stages of recovery and rehabilitation. With profits going straight back into their work, they allow SCT to support more people recovering from addiction. Restoration Station is a vintage furniture shop with a difference. Giving a new life to antique and mid-century furniture provides skills and work experience for people in recovery, it was recently featured in London Design Week and visited by HRH the Duke of Cambridge. At the Paper & Cup coffee shop, trainees learn how to become baristas, serve customers, work in a team and manage a small cafe. Former trainees have gone onto find other work or training. For example, some have the chance to go onto an award-winning apprenticeship scheme with SCT’s partner, Pret a Manger, with a guaranteed full-time job at the end. June O’Sullivan, MBE is CEO of London Early Years Foundation, one of the UK’s largest charitable childcare social enterprises. LEYF has 350 staff across 37 community nurseries in 11 key London boroughs, a thriving apprenticeship programme, and it was awarded Nursery of the Year for 2015 for the second year in a row. LEYF recently opened a new nursery in New Cross. June is a regular speaker on social enterprise and will be showing why social enterprises cannot just rely on consumers’ preference for ‘buying social’ and must instead strive to make a better offer than their ‘non-social’ competitors. Kate is a serial social entrepreneur who is now working full time in Social Enterprise Acumen CIC to achieve the vision of creating enterprising communities in North East England and across the world. She is passionate about creating an ecosystem in which social entrepreneurs and social enterprises can thrive. As well as inspiring social entrepreneurs through her work with Social Enterprise Acumen CIC she is also a Trustee of the Greggs Foundation, a Director of Communities Together Durham, Director/Trustee of ACEVO (Association of Chief Executives of Voluntary Organisations) and a Non-Executive Director of the North East Social Investment Company. Kate was awarded the OBE in 2008 for services to social enterprise in North East England and in 2016 she was the winner of the Queen’s Award for Enterprise Promotion. Ken Banks, Founder of kiwanja.net and creator of messaging platform FrontlineSMS, devotes himself to the application of mobile technology for positive social and environmental change in the developing world. He has worked at the intersection of technology, anthropology, conservation and development for the past twenty-five years and, during that time, has lived and worked across the African continent. He is a PopTech Fellow, a Tech Awards Laureate, an Ashoka Fellow and a National Geographic Emerging Explorer, and has been internationally recognised for his technology-based work. In 2013 he was nominated for the TED Prize, and in 2015 was a Visiting Fellow at RMIT University in Melbourne, Australia. In late 2015 Ken was appointed CARE International’s first Entrepreneur in Residence. He is also a published author, with his first edited book, “The Rise of the Reluctant Innovator”, self-published in late 2013 with a follow-up, published by Kogan Page, released in March 2016. In this talk, Ken will talk about the challenges of social innovation and international development, and how innovation happens ‘in the wild’ vs. in more controlled environments. The 17th century philosopher Spinoza, writing at a time of immense political and religious turbulence, believed that one of the most important political sentiments is hope (so Barack Obama was ploughing a well-worn furrow). As individuals we are relatively weak compared to the cumulative powers of others, but Spinoza said that when we come together through “a common hope” we are strengthened. In these current turbulent times the need to come together has never been more evident. 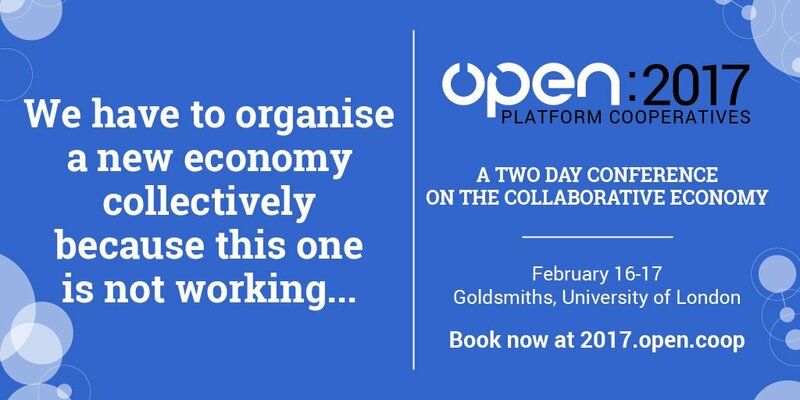 This is why I am delighted that the Institute for Creative & Cultural Entrepreneurship at Goldsmiths is hosting a major conference on cooperation and the collaborative economy, Open:2017 Platform Cooperatives on the 16th -17th February here at Goldsmiths (a few tickets are still available here). We are hosting this conference because, as a department we champion new approaches to the organisation of economic activity: new business models; new sources of finance; and the consequent need for new forms of organisation and management. In this vein we have, for the last five years, run the MA in Social Entrepreneurship with a highly inclusive remit. Indeed, the Social Enterprise field is so varied that it is small wonder that some commentators feel impelled to talk about it as a zoo. For us here in ICCE, that zoo very definitely includes cooperatives and we look forward to hearing how platform cooperatives offer a genuine sharing economy alternative to the likes of Uber, AirBnB, other recent forms of platform capitalism and the ‘super-firms’ dominating the global economic landscape and exacerbating global inequality. Social Enterprise: Which compromises will you make to reach your goals? Social Enterprise: Which compromises – political, social, economic – will you make to reach your goals? Today’s talk will focus on the possibility of working out a reliable model for social enterprise based on my day-to-day practice and experience of success and failure. Tara Anderson’s background is in strategic planning, marketing, public relations, communications and fundraising at executive level in the not-for-profit and social enterprise sector in Australia and the UK. She is the Co-Founder and Director of The Dragonfly Collective. Her passion and career focus is reducing inequality and poverty, particularly through collaborative approaches. There has been a wave of recent interest in approaches to cross-sector collaboration that deliver systemic social impact. ‘Collective impact’ is one such methodology that has been widely adopted in the USA and is currently emerging in the UK. Tara’s contribution will explore the field of collective impact and the barriers and enablers to delivering it in the UK context, based on research completed for her Masters in Social Innovation dissertation. Andrew Curtis has supported some of the most vulnerable and disadvantaged communities in Australia and the UK through executive leadership, Board membership, academic research and lecturing, project design and hands-on service delivery. An original member of the Social Entrepreneurs Network in Australia Andrew has consulted to both government and a range of social enterprises – from the very large to the very small. Andrew has a PhD in hermeneutics and an MBA – combining critical thinking with business models and practice. Paula Woodman has very recently been appointed a Visiting Fellow to the Institute for Creative & Cultural Entrepreneurship. She will be describing the wide range of activities conducted globally by the British Council to promote social enterprise. She was appointed in September 2015 to the new role of Senior Advisor, Social Enterprise at the British Council, having served as their Social Enterprise Advisor since 2012. She previously led on the development and implementation of the Social Enterprise Mark, having moved there from RISE (Social Enterprise SW England) who first developed the Mark. Having worked extensively in the private sector, Alastair Wilson became a student of School for Social Entrepreneurs in 1997. Having established and run his own project, he returned to SSE as Chief Executive in 2004. Alastair is the co-founder and director of Tonic Housing CIC which is looking to develop a fresh approach to LGBT elder living. Alastair has held trustee roles in a number of organisations and is currently a trustee of the Sheila McKechnie Foundation and The Cabrach Trust CIC. He has previously been a trustee of organisations including Social Enterprise UK, UnLtd, Access – the foundation for Social Investment and the Akram Khan Dance Company.